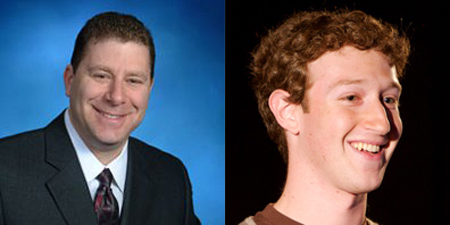 A lawyer named Mark Zuckerberg has been kicked off Facebook – over fears he was impersonating the company’s founder. Mark S. Zuckerberg, 49, was initially denied a Facebook account two years ago and had to prove his identity before he was granted access. Since then he has received up to 500 friend requests a day from random users and gets frequent phone calls from people complaining about the social networking site. But on Monday night his account was suddenly cancelled by Facebook, which cited ”false identity” as the reason. Facebook has since apologised to Mr Zuckerberg, from Indianapolis, USA, and said it will reactivate his account. The confusion caused by his shared name with Facebook founder Mark E Zuckerberg, 26, has forced Mark senior to set up his own website – I am Mark Zuckerberg.com. On the website he sees the lighter side of it and reveals it could be worse and that he could be the New York funeral director Frank Sinatra. He adds: ”I don’t wish Mark E. Zuckerberg any ill will at all. I hope the best for him, but let me tell you this: I will rule the search for Mark Zuckerberg bankruptcy’ if he finds himself in that situation. In reality, it’s highly unlikely the two would ever cross paths. The senior Zuckerberg spends his days dealing with companies facing closure – while Facebook is a $50 billion (US) company whose founder is worth $13 billion (US).